Here is a good exercise to perform for the back, serratus anterior, and rectus abdominus. Start by holding onto a straight bar, just about eye level. Keep your chest up and shoulders down, avoid forward flexion. 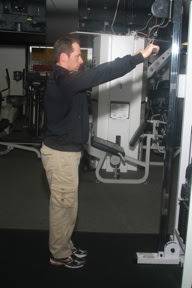 Now pull the bar down, until the bar hits the upper quadricep area. It is very important that you don’t allow the torso to flex forward. You will feel an isometric contraction in the abdominals as you pull the bar down with heavier weight.